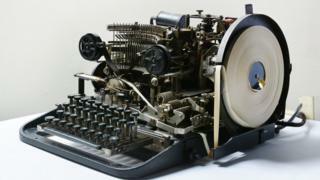 A historic machine used to swap top secret messages between Hitler and his generals has been found languishing in a shed in Essex. Volunteers from The National Museum of Computing at Bletchley Park used eBay to track down the keyboard of the Lorenz machine. The museum, in Buckinghamshire, is now asking people to search for the motor, another key piece of the equipment. "My colleague was scanning eBay and he saw a photograph of what seemed to be the teleprinter," said John Wetter, a volunteer at the museum. He then went to Southend to investigate further where he found the keyboard being kept, in its original case, on the floor of a shed "with rubbish all over it". "We said 'Thank you very much, how much was it again?' She said '£9.50', so we said 'Here's a £10 note - keep the change!'" Andy Clark, chairman of the trustees at The National Museum of Computing, said the Lorenz was stationed in secure locations as "it was far bigger than the famous portable Enigma machine". "Everybody knows about Enigma, but the Lorenz machine was used for strategic communications," said Clark. "It is so much more complicated than the Enigma machine and, after the war, machines of the same style remained in use." The museum has just received one on loan from Norway's Armed Forces Museum, and has a video of how top secret transmissions might have sounded. Volunteers are hoping to recreate the whole process on Friday 3 June, from typing a message in German to cracking the code using wartime equipment. "This gives us the chance to show the breaking of the Lorenz cipher code from start to finish," said Andy Clark. "We can show every single point in the process." When volunteers took the teleprinter back from Essex to the museum, they found it was stamped with the official wartime number from the German army that matches the one on the machine from Norway. But one key part is still missing and volunteers are still searching for it. "It looks like an electric motor in black casing with two shafts on each side, which drive the gears of the Lorenz machine," explains volunteer John Wetter. Volunteers hope the public will look out for it and if all else fails are hoping someone might want to build them a new one until they find it. For more on this story listen to Broadcasting House at 09:00 BST on Sunday 29 May, or catch up on iPlayer.